Demolition permits have been sought at these four Lexington, Kentucky properties. Individual images from Fayette PVA. On March 9, demolition permits were sought for three structures on Euclid Avenue. Permits for wrecking the structures at 626, 630 and 634 Euclid Avenue would pave the way for a development already announced. The location is opposite Marquis from the new Euclid Kroger on its one end and a three story brick-and-glass commercial structure (The Ashland Building). And while Euclid once had a number of single family residences along its way, the area has transformed into a more intensive use. Though these structures, built in the first half of the 20th century, were once representative of the homes along this avenue, they now seem almost out of place. The history of this stretch of road can be told quickly through a few newspaper articles. In July 1903, the Lexington Leader announced that "the work of grading Euclid Avenue in the Aylesford division has been commenced and when macadamized will furnish the shortest route from the Tates Creek Pike to State College." Once the road was paved, houses like the ones proposed for demolition sprung up on what became a residential corridor. In 1920, the road was designated a boulevard and paved with asphalt. But in June 1987, the Herald-Leader found that Euclid Avenue was "an expanding commercial thoroughfare that leads to Chevy Chase" and that it "may be designated a business corridor." The site is proposed to now become a retail and restaurant space; the development plan, also submitted to the city, can be accessed here. 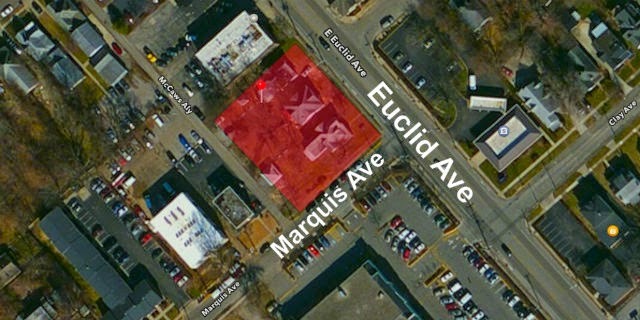 The map below shows its location, with the corner of Euclid Kroger poking from the bottom of the map. 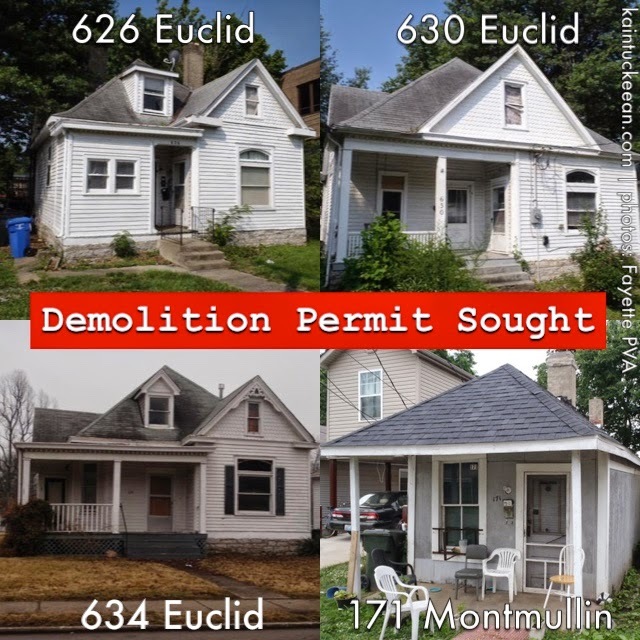 Additionally, a demolition permit for 171 Montmullin was filed on March 11. This single-story shotgun is one of a dying breed. The one-bedroom, one-bath home is only 568 square feet. Built in 1910, it represents an architectural style once prominent in various parts of Lexington and other communities. Rapidly, however, progress is marking the end of the the shotgun style. Each year, more and more shotguns are being demolished. Montmullin Street is located in the Pralltown neighborhood, which is the oldest historically African American neighborhood in Lexington. By 1940, it contained over 200 homes but has been "an ongoing battle to prevent the neighborhood from becoming a new housing area" for UK students for the past twenty years. Unlike the UK fight song, this battle has not been won and the demolition of 171 Montmullin marks another loss to the disappearing Pralltown.